Academic performance and studying problems are two of the reasons students take part in the program. Stressful classes, small apartments shared with strangers and abundant dorm food are just some of the factors that can jeopardize the well-being of university students, from freshmen new to college life to graduate students just weeks away from a Ph.D.
For five years, the Lifestyle Redesign� for the College Student program has helped hundreds of students deal with all these challenges and more, according to Karen McNulty, an occupational therapist with the USC Occupational Therapy Faculty Practice. Students typically meet one on one with an occupational therapist weekly to discuss their concerns and work on implementing the positive lifestyle changes needed to address them. McNulty said therapists can meet with students anywhere the student wants � at the gym to formulate an exercise plan, at the grocery store to help the student plan healthy meals, at the student’s home to help with organization and homework habits, etc. 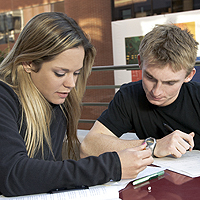 Lifestyle Redesign� for the College Student participants include equal numbers of males and females in many different fields of study, ranging from incoming freshmen requesting assistance in transitioning to a more independent college lifestyle to graduate students wanting to make their routines more effective as deadlines for defenses and dissertations loom. McNulty said students take part in the program for hundreds of unique reasons: physical health and fitness worries, academic performance and studying problems, professional and personal relationship challenges, financial and time management skills and more. The Lifestyle Redesign� partnership with the USC Disability Services Program helps them to cooperate and better serve students with mental health concerns, learning difficulties and other disabilities, she added, and working with USC Student Judicial Affairs and Community Standards allows them to offer assistance to students grappling with other issues that could threaten their USC career, such as substance abuse. “We are non-judgmental � we simply want to help students change their lifestyles in order to be healthier,” McNulty said. With a referral from the student’s doctor, psychiatrist or other health professional, USC student health insurance covers 28 Lifestyle Redesign� for the College Student visits per year with a $15 co-pay per visit, she said, and other insurance plans also are accepted. An initial consultation with an occupational therapist is free. Other Lifestyle Redesign� services are available to assist students trying to lose weight, manage chronic pain or transition from the military to a civilian lifestyle, McNulty said. An OT-inspired student organization named Project Lifestyle: Trojans for Healthy Living also is available to students of all majors looking to share advice and experiences on living in good health. The director of the USC Michelson Center for Convergent Bioscience and the MESH Academy becomes the university’s second current faculty member in the prestigious society. The MacArthur Fellowship recipient and professor of English is the 34th USC faculty member elected to the prestigious academy.